06/22/17 Santa Cruz River Farmers Market held at the San Augustin Mercado in Tucson AZ on a hot summer night with temperatures hovering at 109 degrees. Greetings from the Santa Cruz River Farmers’ Market! We’re taking over FMC’s Instagram this week to share with you a look into our market. The market is loved by our community, and for good reason! As a new “visitor”, there are a few things you ought to know to fully appreciate the market that surrounds you. 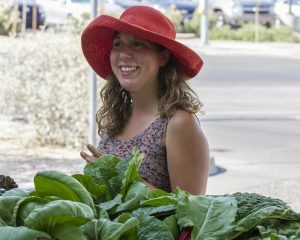 The Santa Cruz River Farmers’ Market is one of two farmers’ markets run by The Community Food Bank of Southern Arizona. Why the heck does a food bank have a farmers market?! Well, I’m glad you asked…We have a greater impact on hunger & poverty in our community if we utilize a multi-pronged approach. While the food bank does offer emergency food boxes for families that are experiencing hunger today, we also have a variety of programs focused on bringing folks out of poverty in different ways. We value this incredible place we live and the abundance it contains, even on days when the thermometer hits 117*!! Providing opportunities for farmers, producers and small scale-backyard gardeners to sell what they grow/make while connecting with community members is a win-win! Increasing access to fresh, local & nutritious fruits & vegetables to communities that are struggling with poverty is a HUGE focus for us! We are proud to report that 30% of our sales are in public assistance, that means 30% of the fresh produce that we sell ended up on tables of families who are utilizing SNAP (food stamps), WIC/AZFMNP checks and other forms of public assistance. We love working with partner organizations to provide fun, engaging & delicious cooking demonstrations at our markets, highlighting ways to make classic recipes a little bit healthier with fresh local foods! Other demos we do, teach people how to harvest their own backyard! Learn how to harvest & use prickly pear, cholla buds, mesquite pods and much much more at our ongoing desert harvesting series! Our markets are lively, family friendly & a genuine good time. You might come to buy some of our incredible citrus, MEYER LEMONS? Yes, Please! But you will want to stay for the great music, delicious pupusas, exciting scavenger hunts and laughs with your neighbors! We are so excited to take over FMC’s Instagram account because we are THRILLED to have the opportunity to expand our community, share the magic that is our farmers’ market and make new farmers’ market friends! We are so proud to share it with you! Next time you are in Tucson, come down and say Hi!